Are you maximizing your time by taking advantage of a dashboard? Dashboards are one of the most beneficial and functional parts of a system and yet are often the most underutilized. Dashboards are comprised of dashparts, or widgets, which are used as a portal into your Deltek database. For firms using Deltek Vision or Deltek Talent, the dashparts are extensive and include reports, metrics, links, alerts, tips and more. Deltek Dashboards not only provide you immediate access to the needed information right at your fingertips, but also serve as the entry point to your company data. They provide you quick visibility into areas significant to your specific role and can be easily customized for your needs. While there are many benefits to a dashboard, let’s focus on three major ones. Instant Access to Information – A dashboard allows you to view already compiled daily reports when you open your software in the morning. The dashboard also shows reminders of the day’s tasks and alerts that require follow-up. Each dashboard is set-up with the information vital to each user’s role. In addition to reports and reminders, dashboards include information to ensure you are meeting goals and objectives for your role and for the company. Avoid Repetitive Navigation – When you utilize the dashboard components, you avoid the tedious and time consuming task of searching through the navigation panel to get to the data needed on a daily, sometimes hourly, basis. Reduce your clicks down to one or two by creating shortcuts to reports, URLs, links, and more. The extra time saved allows you to focus on other areas of your work. 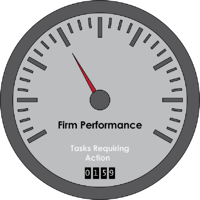 View Role Specific Data – Role specific data can be set up to focus on the role you play in your firm. Even more, specific predefined dashboard configurations can be pushed out to you based on your role. For example, if you are a project manager, you may want to have project budgeting, billing information and possibly accounts receivable invoicing review. With role specific data, each user has immediate access to the tools necessary to do his unique job. Regardless of your role, there are benefits for every user when utilizing a dashboard. Immediate data access, saving navigation time and the convenience of role-based setups are just to name a few. Now that you have realized the benefits, it’s time to fully utilize dashboards at your firm.